The U.S. state of Oregon has an extensive history of laws regulating the sale and consumption of alcoholic beverages, dating back to 1844. It has been an alcoholic beverage control state, with the Oregon Liquor Control Commission holding a monopoly over the sale of all distilled beverages, since Prohibition. Today, there are thriving industries producing beer, wine, and liquor in the state. Alcohol may be purchased between 7 a.m. and 2:30 a.m. As of 2007, consumption of spirits is on the rise, while beer consumption is holding steady. Also, 11% of beer sold in Oregon was brewed in-state, the highest figure in the United States. Oregon wine production began in the mid-19th century, before it was a state. By 1919, the industry had collapsed due to prohibition, and after prohibition ended fruit wines dominated the industry. The modern era of Oregon wine began in 1961, and the industry cemented its reputation in 1975 by winning a French award. In 2007, wine making was a $207.8 million business. Beer production began in 1852 with Henry Saxer’s liberty brewing in Portland. In 1862 Henry Weinhard’s bought the Liberty brewery. The company is now a part of the Miller Brewing Company, but it helped Portland to become the microbrewing capital of the world. Portland hosts North America’s largest beerfest, and Oregon has produced a number of national and international award winning beers. In 1844, the Oregon territories voted to prohibit alcoholic beverages. This was repealed in 1845, but prohibition was reinstated in a 1915, four years before the national alcohol prohibition. When national prohibition was repealed in 1933, the Oregon Liquor Control Commission (OLCC) was created. Unlike states that allow liquor sales in grocery stores, liquor in Oregon is sold only in OLCC run liquor stores and establishments that have liquor licenses, and the OLCC has strict guidelines and training to ensure that all licensed venues understand how to safely sell and serve alcoholic beverages. Alcohol and alcoholism are also studied by the state at the Portland Alcohol Research Center. Alcohol laws in Oregon permit the sale of beer, wine, and liquor, for on- or off-premises consumption, between 7 a.m. and 2:30 a.m. In 2004, Oregonians consumed 5,103,000 US gallons (19,320,000 L) of distilled spirits, 11,132,000 US gallons (42,140,000 L) of wine, and 80,415,000 US gallons (304,400,000 L) of beer, ranking it 27th, 19th, and 27th respectively of US states. Oregon had an estimated population of 3,594,586 in 2004, ranking it 27th among US states. In 2007, sales of spirits increased 9% over the previous year. Whiskey and vodka were the top sellers, while tequila had the largest percentage increase. Oregonians’ top buy was Jack Daniel’s, with 412,000 bottles sold. This was during a national spirits trend where manufacturers introduced new products and advertising aimed at young drinkers. Again in 2007, Oregon’s 2.6 million adults on average drank 32 gallons of beer each, versus 4 gallons of wine and 2 gallons of spirits, but sales of beer hadn’t increased like sales of spirits. The Oregon Department of Human Services reported that while drinking among 8th–11th graders has fallen nationally, it has increased in Oregon. The number of DUI offenses dropped between 2002 and 2005, from 25,342 to 23,455. Wine grapes were planted in Oregon in the Willamette Valley starting in 1847. A census in 1860 revealed that Oregon’s wine production was 2,600 gallons. In the 1880s and 1890s, German immigrants began planting wine grapes in Southern Oregon. In the 1880s, Ernest Reuter garnered a reputation for his Klevner wines, grown in the Willamette Valley, west of Forest Grove. By 1919, the Oregon wine industry had collapsed due to the temperance movement and resulting prohibition. Fruit wines dominated Oregon’s wine industry post-prohibition, and by 1938 there were 28 bonded wineries, producing wines based on berries, Concord grapes, and other American hybrids. Oregon’s modern wine industry dates to 1961 when Hillcrest Vineyard in Roseburg began planting Riesling and small amounts of other grapes. In 1965, Oregon pinot noir was established when The Eyrie Vineyards planted grapes near Corvallis. Oregon’s wine reputation was made in 1979 when a French magazine ranked The Eyrie’s 1975 Pinot noir third among 330 wines of the world. By 2007, Oregon wineries were producing 1.7 million cases of wine for a total of $207.8 million in sales. In 1862, German immigrant Henry Weinhard founded a brewery in Portland. By the early 1880s it had become the Northwest’s largest brewery. Weinhard once attempted to pump free beer through Portland’s Skidmore Fountain. He died in 1904, but the company continued to do well, making it through prohibition by brewing soft drinks and merging with Arnold Blitz, a local competitor. Blitz-Weinhard was sold to the Pabst Brewing Company in 1979, and then again to the Miller Brewing Company in 1999. The company helped prepare Oregon beer drinkers for the arrival of microbrewing. Portland, Oregon is considered to be the nation’s microbrew capital. A microbrewery is defined as one that produces less than 15,000 barrels a year. Portland hosts the Oregon Brewers Festival, North America’s largest beer festival. The microbrewery industry began in 1979 when President Jimmy Carter legalized home brewing. In 2006, 14 beers from eight Oregon breweries won medals at the Great American Beer Festival, out of 2,800 entries. Also in 2006, Oregon won 11 times at the World Beer Cup, in a field of 2,200 beers. In 2007, 11% of beer sold in Oregon was brewed in-state, the highest figure in the United States. According to the Oregon Hop Commission, in 2007, Oregon was also the second largest U.S. hops producer, after Washington. In 1933, national prohibition ended with a repeal of the Eighteenth Amendment to the United States Constitution. Oregon’s governor, Julius Meier, appointed Dr. William S. Knox to study the situation. Knox recommended adopting the Canadian system of sales of alcohol by the state. The reasoning was that this would provide revenue and lower alcohol abuse. The Oregon Legislative Assembly held a special session and the OLCC was created days after the repeal of national prohibition. Eighteen states in total chose to regulate alcohol. Oregon Revised Statutes Chapters 471, 472, 473 and 474 were the commission’s enabling statutes. OAR Chapter 845 governed its administrative rules. 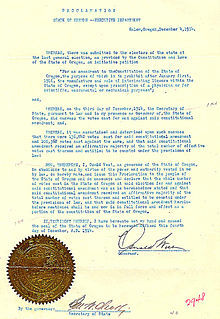 The OLCC’s mission is “to effectively regulate the sale, distribution, and responsible use of alcoholic beverages in order to protect Oregon’s public health, safety and community livability.” However, under these laws bootlegging in Oregon was rife and Portland became infamous as a center of corruption. In 1939, the advertising of hard liquor on billboards and in newspapers was voluntarily discontinued. Also, in 1939, a “club bill” was passed by the Legislative Assembly. The bill gave regulatory power to the OLCC over hotels, restaurants and private clubs where liquor was served. Lobbyists then succeeded in having the bill referred to the voters in 1940. Voters passed the bill in 1940. In 1944, the “Burke Bill” became law: wines with more than 14% alcohol could only be sold by Commission stores and agencies. Also in the 1940s, a “service bars” license was established. This restricted liquor licenses to establishments serving food. In 1949, the Legislative Assembly approved a method where establishments that sold liquor could ask for proof of age from patrons they thought were under the age of 21. Measure 15—passed in 1952—amended the Constitution (Article I, section 39) to regulate the sale of liquor by the individual glass. Five more types of licenses were created in the 1950s, dealing with liquor-by-the-drink operations, industry agents, salesmen, out-of-state manufacturers of malt beverages, and conventions, group meetings, etc. In 1960, establishments were required to have food sales equal to 25% of their total sales. In the 1970s, the OLCC began enforcing the Oregon Bottle Bill and wines of up to 20% alcohol became allowed with certain licenses. In the 1980s, the number of OLCC commissioners was changed from three to five, to reflect the number of congressional districts. The 1990s saw a flurry of laws passed governing the OLCC’s oversight of the newly numerous Oregon wineries and microbreweries. House Bill 4028–passed in 2002–allowed liquor stores to operate on Sunday; they had previously been restricted to six days a week. This sort of licensing is very important for maintaining safe production and sales of alcoholic beverages in Oregon. Under Oregon law, specifically ORS 471.565, bars and restaurants can be held legally responsible for any damages to property or injuries incurred when an intoxicated person is served alcohol and causes a car crash. Measure 3 (1904), a “local option” law, passed. Permit is needed to make Alcohol. The center has trained medical students in alcohol-related issues for more than 30 years and has published more than 380 papers and articles since 1996. ^ “How to Get a Liquor License?”. Retrieved 17 July 2012. ^ “OLCC Law Orientation Booklet for Retailers” (PDF). OLCC. August 2007. Archived from the original (PDF) on 2008-10-10. Retrieved 2012-04-09. ^ a b “Top metropolitan areas for beer, 2004”. Beer Handbook. Bev-AL Communications, Inc. 2005-01-01. Archived from the original on 2008-11-19. Retrieved 2012-04-09. ^ “Oregon”. City-Data.com. Archived from the original on 3 January 2009. Retrieved 2008-12-23. ^ Har, Janie; Ryan Kost (July 19, 2007). “Cocktails push up liquor sales”. The Oregonian. Retrieved 2008-12-23. ^ a b Hall, Lisa Shara (2001). Wines of the Pacific Northwest. Mitchell Beazley. Archived from the original on 2006-08-11. Retrieved 2008-12-23. ^ Hale, Sally Carpenter (December 14, 1997). “A Taste of Success”. Los Angeles Times. pp. Metro, Part B, p. 1. Retrieved 2008-12-23. ^ Sarah Skidmore (March 18, 2008). “Oregon wine grape production hits record”. The Seattle Times. Archived from the original on July 13, 2012. Retrieved 2012-04-09. ^ “American Viticultural Areas of Oregon” (PDF). Oregon Wine Board. Archived from the original (PDF) on 2009-03-25. Retrieved 2009-01-11. ^ “2006 Oregon Vineyard and Winery Report” (PDF). Oregn Wine Board. February 2007. Archived from the original (PDF) on 2009-03-25. Retrieved 2009-01-11. ^ Alworth, Jeff (February 24, 1999). “Goodbye Blitz-Weinhard”. Willamette Week. Archived from the original on March 13, 2008. Retrieved 2008-12-23. ^ “Introduction to Portland”. The New York Times. Frommer’s. 2006-11-20. Retrieved 2008-12-24. ^ Heim, Joe; Greg Kitsock (April 7, 2008). “Beer Madness Crowns a Winner”. The Washington Post. Retrieved 2008-12-24. ^ a b Greif, Andrew (September 17, 2007). “Good beer: what Oregon does best”. Oregon Daily Emerald. Archived from the original on June 11, 2007. Retrieved December 23, 2008. ^ Dininny, Shannon (January 13, 2008). “Wash. entrepreneurs getting into the distillery business”. Seattle Times. Archived from the original on 2011-05-24. Retrieved 2008-12-23. ^ Watts, Joe (July 14, 2008). “Happy Daze Are Here Again: Integrity Spirits Releases Trillium Absinthe Supérieure”. Willamette Week. ^ a b c d e f g “Oregon Liquor Control Commission (OLCC) Administrative Overview August 2000” (PDF). Oregon Secretary of State. Retrieved 2008-12-22. ^ a b c “Initiative, Referendum and Recall: 1948-1952”. Oregon Blue Book. Retrieved 2008-12-23. ^ “Initiative, Referendum and Recall: 1912-1914”. Oregon Blue Book. Retrieved 2008-12-23. ^ a b “Initiative, Referendum and Recall: 1916-1921”. Oregon Blue Book. Retrieved 2008-12-23. ^ “Initiative, Referendum and Recall: 1930-1936”. Oregon Blue Book. Retrieved 2008-12-23. ^ a b c “Initiative, Referendum and Recall: 1938-1947”. Oregon Blue Book. Retrieved 2008-12-23. ^ a b c “Initiative, Referendum and Recall: 1902-1906”. Oregon Blue Book. Retrieved 2008-12-23. ^ a b “About PARK Overview: Uncovering the genetics of how the brain adapts to alcohol”. OHSU. Archived from the original on 2012-12-14. Retrieved 2008-12-22. ^ “Research component & core structure”. OHSU. Archived from the original on 2012-12-15. Retrieved 2008-12-22. ^ “PARC Publications”. OHSU. Archived from the original on 2012-12-12. Retrieved 2008-12-22.